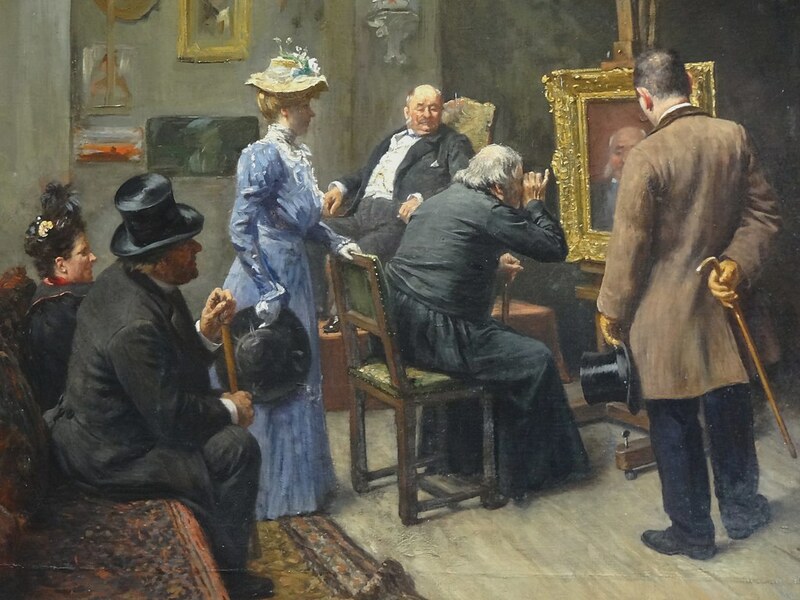 “Critique du portrait”, Henri Brispot, 1900. Welcome to the final part of designer Alex Roberts and Lizzie’s three-part series on larp critique. Previously, we defined larp critique, particularly in contrast to reviews and criticism. We went on to explore how critique serves both the medium and the community in a positive way. Since we published our first post on critique, we’ve had many responses asking the same question: “How?” How should critique be structured, and delivered? What defines good critique, and what pitfalls should be avoided? It’s clear to us that there is a strong need in our community to foster productive and thoughtful discussion, and larpers are obviously very concerned with doing so in a way that is productive, and respectful of the considerable amount of energy that goes into designing and producing an experience for others. So, let’s wrap up this miniseries by addressing the question of how. Remember that larp critique is a response to a larp, group of larps, or technique, that analyzes specific aspects of design, and their effects. Critique does not merely describe what happened–it makes connections between cause and effect. It expresses an evidence-backed argument about why the larp experience was what it was. Critique explores the why behind larp design, answering questions like, “what was the impact of this design choice?” “How could the outcome have changed?” “What statement was the designer making?” “What assumptions does the design carry, implicitly or explicitly?” “What are the implications of those statements and assumptions?” Note that these are open-ended questions that elicit subjective answers. A critique expresses an opinion, but backs up that opinion with reasoning and evidence. So, if we are to make arguments that get at the heart of what a larp really does, what it’s about, and how it impacts the people who engage with it–what’s the best way to tread such delicate territory? Our recommendation is to be both precise and compassionate. A work of critique must have a thesis–that is to say, it should be written with the intent of arguing a specific point. Articulate what you think the intention of the designer/organizer was, what design elements were used, and what outcomes the implementation of those elements produced. Remember you can focus on a specific design element across multiple larps. Be specific about how you connect a design element and an outcome. The more clearly you can connect design choices to experiential outcomes, the more helpful you’ll be to others who want to pursue the outcomes you identify in their own play or design. Good critique is done in service to a community, not to prop yourself up as a Brilliant Critic (TM). As we’ve said in previous posts, a healthy culture of critique allows designers to make more intentional decisions about what elements they want to incorporate, and helps players know what kinds of games to seek out (or avoid!). We use the term “compassionate” because the essence of compassion is to not put yourself above, or below, anyone else in how you act. Snark can be entertaining, and unfortunately, it tends to get a lot of attention. Social media, which is still our primary tool for larp-related discussion, actively reinforces expressing thoughts in a way people will react strongly to. To counter-weight this tendency, think before you post. Ask yourself: will this help anyone? Who benefits from this? Spend some time with that. Only you can know if you are being honest with yourself. Good critique also separates art from the artist whenever possible. Attributing the best motives to a designer not only invites them to look critically at how those motives played out (rather than putting them on the defensive)–it also spares you the inevitable “but they’re nice!” responses, if your critique is interpreted as negative. Artists do not necessarily share every quality with their works. Assuming good motives doesn’t mean pretending the results were ideal. There is no way to help each other be better without being honest about how we’re doing right now. And there are certain kinds of critique that matter more than the personal feelings of whoever wrote or organized a given larp. Warning the person about to cross a rickety bridge is the right thing to do, even if someone who did their very best building that bridge is hurt by your words. Compassion is not always nice. If you find yourself writing critique for the purpose of harming someone or to feel smart, that’s not compassionate. But avoiding critique because you’re worried about the feelings of someone involved? Also not an expression of compassion, unfortunately! Remember what we wrote above: focus on the design, not the designer. Many larpers recommend “the compliment sandwich” when giving playtest feedback: begin and end each suggestion with a compliment. But critique is not feedback, given to the designer. It is a focused, reasoned argument that identifies design choices and analyzes the effects of those choices. It’s ok. You can put the sandwich down. Why be Compassionate and Precise? Remember: we’re all in this together. If someone’s work isn’t your cup of tea, chances are you’ll be shaking hands at a con before you know it, or at least commenting on the same Facebook thread. Because so many of us who play also design and organize, we can have strong opinions about how the games we’re in should operate, while still having sympathy for what we know is happening behind the scenes. We present compassion and precision as useful guiding principles to keep the community healthy while also advancing the medium. Make a connection between an element and an outcome, and try your best to do so in a way that invites further dialogue. After all, we’ll have to respond to each other’s critique with precision and compassion as well. What else is important to the practice of good critique? This entry was posted in Larp and tagged Alex Roberts, Larp Critique, larp theory, Notes Toward Larp Critique by Lizzie Stark. Bookmark the permalink. Understand that each larp is different–the run you attended might have been the worst of an otherwise great larp. If possible, solicit other opinions from other participants. Ask questions of the designers–what you think is a bug might be a feature, and vice versa. It also helps to get some idea of artistic intent, if any, behind their design choices. Most larps are widespread experiences across multiple individuals, and your subjective experience might not have been the same as another. It helps to get more data from more sources–the designers, other players.